Over the last couple of years, I've been researching the benefits of reading literary fiction. Studies I've found show links between fiction and empathy, fiction and critical thinking. Although it's rarely mentioned in the research though, fiction is an excellent vehicle to inform. I remember reading that before she began writing novels, Barbara Kingsolver wrote about science, the environment, and other scientific and political issues important to her. Who's going to read a book about saving the environment? People who already care about the environment. Through fiction, though, we walk in the shoes of people who do care and along the way, we learn. Sometimes we even learn to care. Like most readers I know, I would be unlikely to read a book (or even a magazine article) about a disease with which I had no connection. 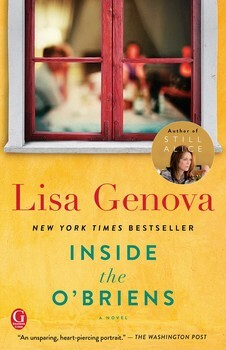 But I've already read two other novels by Lisa Genova, who has a Ph.D. from Harvard in neuroscience: Still Alice and Left Neglected, learning about early-onset Alzheimer's and brain injury. Reading her latest novel, Inside the O'Briens, I was introduced to Joe O'Brien, a 44-year-old Boston cop, an Irish Catholic father whose four grown children live under his roof. At the prompting of friends on the force noticing some physical traits, his wife insists he go for a physical, where they learn he has Huntington's disease, a hereditary condition affecting about 37,000 people in the U.S.--about the number that would fit in the Red Sox stadium. That's a number far smaller than cancer or Alzheimer's, so the incentive to find a cure--or even an effective treatment isn't great. But, as the O'Briens learn, Joe's children have a fifty-fifty chance of inheriting the genetic markers that inevitably lead to this debilitating disease and early death, and those who do inherit the trait have the same odds of passing the disease to their own children. Genova sometimes shifts the perspective from Joe to his younger daughter Katie, a 21-year-old yoga teacher living in the shadow of her sister, a ballet dancer. Katie has a new boyfriend Felix who is the opposite of what her parents--especially her mother--want her to marry: He's black, protestant, and worst of all--a New York Yankees fan. While the subject matter might seem too dark and depressing to keep readers interested, it's just the opposite. Genova so clearly communicates Joe's frustration with his inability to control his body and Katie's fear for siblings and her reluctance to find the answer to her own genetic testing so she can move forward. In the most moving scene, she lets her father know that in handling his situation, he is teaching his children how to die--and how to live. The close-up view of the life of a Boston policeman, especially after the marathon bombing, is fascinating. Katie's yoga practice, which she shares with her sister and father, also adds another interesting dynamic to the story. Throughout the narrative, too, the family's faith is tested as they must decide between blacks, whites, and grays. Genova leaves readers with characters who weather disease, live with their flaws, but mainly who love. She may, along the way, increase interest in this disease in need of a cure. Here we go again: Packing boxes with everything we own, this time to move to Nashville, Tennessee, where we will live less than ten minutes from our daughter, son-in-law, and grandchildren! As with every move I've ever made, the hardest part is packing the books. At least they fit into boxes well, but I spend far too much time putting them together by my odd categories. I'm even trying to weed out books I might take to the used book store. After trying to read a mass market paperback copy of Michener's The Source, I realize my eyes can't read that small print anymore. I've come across several books that are worn either from re-reading or from teaching over and over. In the photo here I feature my copy of The Prince of Tides, which may be tattered in part because my sister threw it across the room when she read it. the middle copy is John Knowles' A Separate Peace, which I taught over and over (even though I learned that if I showed the film I should stop it before they start singing their song about Hitler's genitalia over and over and over). At the bottom, also rubber banded is Charles Frazier's Cold Mountain. I have a hardback first edition, signed by the author, but this is the paperback I used to teach the book in AP English for years. When I bought the paperback it was packaged with a "soundtrack to the book," long before the movie, by Tim O'Briens, John Herrmann, and Dirk Powell. I've also had occasion to recommend books I've loved to friends who missed them the first go around: Stout's Olive Kitteridge and Wroblewski's The Story of Edgar Sawtelle. To be honest, if I had time, I'd re-read them myself. Even some of my old classics have beckoned: Watership Down and The Once and Future King. But I don't have much time to read right now. I'm packing. As I've been reading other people's list of books read this year, I keep wanting to ask, "But which ones did you like best? What should I read?" I decided to add notes about a few of the ones I read this year. Shari Smith, I Am a Town. This book was one of my favorites from an author who’s become a friend too. I’ve given several copies as gifts. Her tribute to Claremont could translate to any small town that becomes home. Alan Bradley, The Chimney Sweeper Comes to Dust. Must to my surprise, I am captivated by this series of books with an 11-year-old protagonist. I love Flavia. N. T. Wright, Simply Good News. Of all the Bible-related books I read, this was probably my favorite. While Wright is a theologian, this book is ultimately readable. Tony Earley, Mr. Tall. Would someone PLEASE read this so I can talk about the last story, the Jack tale, with someone who has read it. Maureen Corrigan, So We Read On. My favorite “book about books” this year—a tribute to The Great Gatsby. Kate Atkinson, A God in Ruins. Not exactly a sequel so much as a parallel to her Life after Life, I loved Teddy, the protagonist. Rebecca McClanahan, Write Your Heart Out. I loved working through this writing book with friends on line this summer. Good stuff, leaving room to go one’s own direction. Kazuo Ishiguro, The Buried Giant. This book read like a parable to me. I want to go back to parts of it to understand the world today. Rachel Joyce, The Love Song of Queenie Hennessy. Like A God in Ruins, this too is a companion read to The Unlikely Pilgrimage of Harold Fry. It’s amazingly bright for a book set primarily in hospice. Colum McCann, Translantic. I started this one, stopped, and picked it up a year later. I’m glad I did. It covers such a span of history—from Frederic Douglas to Clinton. Kent Haruf, Our Souls at Night. I’m sad there will be no new books by Haruf. I still rate Plainsong and Eventide as all-time favorites. This one, set in the same place, takes unlikely, ordinary protagonists and makes readers care. Kate Clanchy, Meeting the English. A good British farce that no one I know has read! James Michener, The Source. I used to power-read Michener but had missed this one. Since it explores the Middle East from the beginning of time through idol worship, Judaism, Christianity, and Islam, it’s so timely. Ron Rash, Above the Waterfall. I never met a Ron Rash book (novel, short stories, or poetry) I didn’t like. I’m glad to know he’s a disciplined writer because I can expect more. His characters are complex, drawn in shades of grey. Nellie Hermann, The Season of Migration. This story of the life of Vincent van Gogh, when he aspired to become a minister, like his father, was at times painful. It was worth reading, in my opinion, for the sensory description of van Gogh’s experience when he went down into the bowels of the mine to understand his parishioners daily lives. Meg Mitchell Moore, The Admissions. After working with high school seniors for so many years on college entrance essays and applications, this was funny, tragic, and true. Joseph Bathanti, Half of What I Say Is Meaningless. I’ve read lots of Joseph’s poetry and consider him a friend. These essays are pitch-perfect. Fredrik Bartak, A Man Called Ove. I started this book when one of my favorite librarians recommended it, but at first I was uncertain. I didn’t think I liked this old curmudgeon. Wow! I’m glad I kept reading. Louise Penny, Still Life. This book got me started on the whole series. I’m hooked—and there are several more to read! Austin Kleon, Steal Like an Artist. This little sleeper sat on my shelf for a long time. I picked it up at just the right time. For anyone who wants to channel creativity, this one is so motivational. Gretchen Rubin, The Happiness Project. I took my time reading this book they way it’s written: one chapter a month. Now I wish I had someone else to go through it with me the same way this year. I would love a book club project with this at the center.